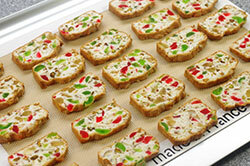 The thin, crisp cookie slices studded with candied, or glacé fruits will make you think of stained glass. This recipe can easily be doubled. 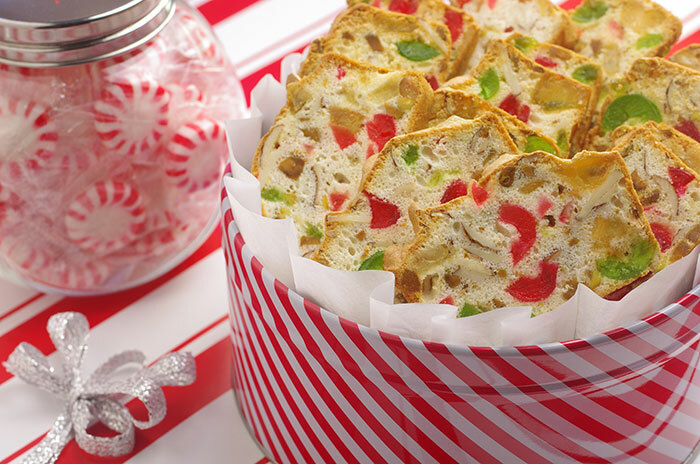 COOKIE EXCHANGE TIP: For a more festive look, tie 2 or 3 of these cookies together with ribbon. 1. Preheat the oven to 350°F. Lightly grease or spray an 8-inch square pan. 2. 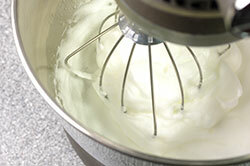 In a large bowl, with an electric mixer, beat the egg whites on high speed until soft peaks form. 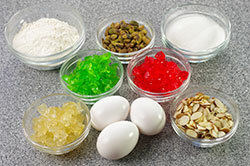 Sprinkle the sugar over the egg whites and continue beating on high speed until the sugar is incorporated. Sprinkle with the flour and beat until incorporated. Stir in the almonds, pistachios, pineapple, and red and green cherries. The batter will be thick. 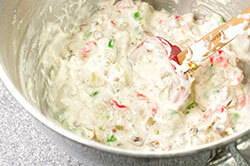 Spoon the batter into the prepared pan and smooth the top. 3. 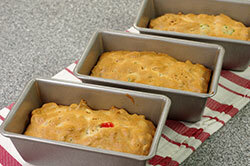 Bake in the center of the oven until golden brown on top and firm to a light touch, 35 to 40 minutes. Let cool completely on a wire rack. 4. Carefully invert the pan onto a work surface. 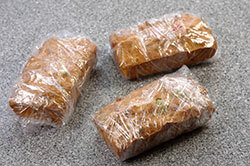 Wrap the cookie block in plastic wrap and refrigerate for 1 day. 5. Preheat the oven to 350°F. Have ready a nonstick cookie sheet. 6. 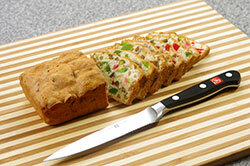 Using a sharp knife, carefully cut the cookie block into 1/4-inch-thick slices. Place the slices on the cookie sheet. 7. Bake in the center of the oven until crisp, 5 to 10 minutes. Let cool completely on the cookie sheet on a wire rack.